Rebuild the Church in keeping with the building gutted by the fire. It will include energy efficient heating and lighting systems. Build an Annex on the north (graveyard) side of the Church which can offer a fully accessible new public space available for both Church activities and local community groups. 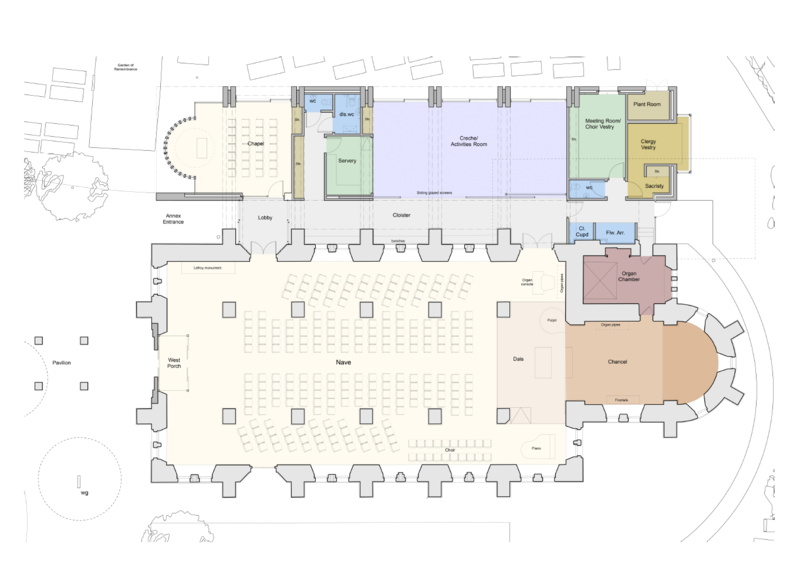 It will be a light, comfortable, flexible space, complementary to the architecture of the existing Church. It will have its own separate access. Facilities will include a quiet space, a small and large meeting room for local groups to meet, hold exhibitions, lectures, etc. a small kitchen, and accessible toilets. Restore the west door which was part of William Burges original design. This will make access easier for weddings, baptism parties as well as those whose life will be celebrated by their families, alongside the day to day use for the whole Fleet community. Reorder the worship area around the pillars to enable all to see, hear and take part. This will include a new audio visual system. We want to restore the town’s Parish Church – the only grade II* listed building in Fleet. The task of mission and outreach is greater than it has ever been. We want to offer easy access to the Church and annex, help those who feel socially isolated, and generally be able to offer the town of Fleet a special venue for their activities. What a terribly sad event. A beautiful church with happy memories of our son’s Christening in 2006 and the place we worshipped first as a family. Prayers to all involved and for the future rebuilding of the church. We were married here, and I have enjoyed bringing both our children to praise and play in the church. We have always received an inclusive welcome from the church family. My hope would be that the church would be rebuilt so that it can continue to be a place where the community can connect with God and each other. We got married here nearly 8 years ago and I’m deeply saddened to know that this is potentially an act of arson! Such a beautiful church with so many wonderful memories for so many people in our lives. I really hope that the community can pull together to rebuild the church and continue the wonderful work it does. Prayers for all involved in restoring this beautiful church, the heart of Fleet. My husband’s funeral service was held there in July 2008, a very sad day for so many people. My grandparents served as Churchwardens and PCC members for many years, my sister was in the choir and I served as an acolyte there in the 1990s, as well as having my confirmation there. Our thoughts and prayers are with your congregation. We had a similar experience at St James Clanfield Hampshire in 2008. Take heart that God will use this experience to strengthen you and deepen your fellowship and relationship with the community. God moves in a mysterious way His wonders to perform. Whatever the cause of this sad event there will be within it the seeds of resurrection to a new life. While mourning the loss of such beauty and cherishing the memories of the past, you have in Fr Mark a priest of vision who will surely lead his people to a new home in which the old will be a firm spiritual foundation for future life within the family of God’s people. Prayers and love will surely go out to you from the Trinity Benefice in Folkestone at this challenging time. Like so many others, I too have many memories associated with the Church – commencing when my grandparent’s retired from India to Fleet in the late 1940’s and were regular church goers. My grandparents funerals and my parent’s funerals were there. I sang in the choir there, was confirmed there and later married there. My children were baptised there and my daughter was married there. My granddaughter was baptised there and my second granddaughter was due to be baptised there in November……….Such a sad time. My thoughts go out to all those so immediately affected by this devastating fire. Utterly devastated at what has happened, I have thought of very little else since hearing the news. My family have only been living in Fleet for two years but my daughter was baptised at All Saints last year, and my son loves to point out the “beautiful church” whenever we walk past. We have been made to feel so welcome. My thoughts are very much with you at this sad time and my prayer is that strength is found in due course to look to the future with positivity. I remember going to a carol service near midnight on Christmas eve circa 1964. It was an amazing service, by I think Canon Robbins and Father Robin Taylor. When we came out it was snowing and thetrees were all white- oit was just like a Christmas card. Christmas seemed very real, timeless. Our prayers are with everyone today. It is a huge loss but I know that the community will pull together in whatever way is needed. The building may be badly damaged but a church is so very much more than bricks and mortar. Love to all. With love and prayers from the people of another All Saints’ Church, down the M3 in Basingstoke. We have so many memories associated with the Church over the years. My Grandparents, Parents, Aunts, Sisters and myself were all married there, we were Christened and Confirmed there. We had both my parents’ funerals there and their ashes are in the Memorial Garden. My parents were both Church Wardens, my mother being the first ‘lady Church Warden’. She was also responsible for the Church flowers for very many years. The kneelers were another of her projects, She co-ordinated the making of them (making quite a few herself) and then storing in our house, gradually taking over most of the rooms! We wonder if any survived? I was shocked & saddened to hear about the devastating fire at All Saints, my aunt’s church for many years. She was Helen Knapman, whose funeral was held in your beautiful church some years ago. I remember the warmth of the congregation on that occasion & I’m so sorry you have all suffered this tragedy. However, I’m sure you will restore All Saints to its former glory in due course, & I wish you all well in the coming months as you begin the challenging task. May God bless you & help you, every step of the way. My great, great grandfather is buried there, my grandfather, father and his brother were in the choir in the 30’s, my parents and godparents were married there, all the olds funerals were there, my Aunt Bertha (Mrs Waite) ran the Sunday School and I sang there with P and J’s choir.My son Matthew was Christened there. A huge and senseless loss, but it is more than just bricks and can be rebuilt. The Parish of Fleet has so many wonderful and faithful people. I am convinced that you will rally together as a community and that out of the ashes something new and beautiful will grow. After all – we are a people of the resurrection! The thoughts and prayers of all us here at St.Anne’s Bagshot are with you at this moment in time. This lovely church welcomed us with open arms into the Friday playgroup a mere 6 days after moving from London to Fleet – I knew then that we had moved somewhere amazing. I am so sorry for what has happened. The strength of feeling from the community is testament to how much the church meant to people (churchgoers and non-churchgoers alike) and I’m sure we will come together to help rebuild it. Love and thoughts. When visiting family there several times it was our church home, with family attending since the 1930s. I hope it can be rebuilt! Terribly sad to hear such sad news. I was the photographer that shot the last wedding there (20th June 15). Thinking of all of you at All Saints. It was a stunning place and one of my favourite places. Our thoughts and prayers are with everyone in the All Saints family. We are sure everyone will rally round to help; and if there is anything we can do, please let us know. We know you will find the strength to rebuild. Dogmersfield C E (A) Primary School.